In this age of multi tasking users are always have the need to use different applications for different uses, having all the shortcuts on the desktop is not the best options as this can make the desktop too cluttered.An easy way out is the use of application launcher like the Application Dock in Mac, or similar application for Windows OS like Circular Dock, PStart, etc. Portable Start Menu is a application which makes it easy to launch app from a easy to use menu from the system tray. 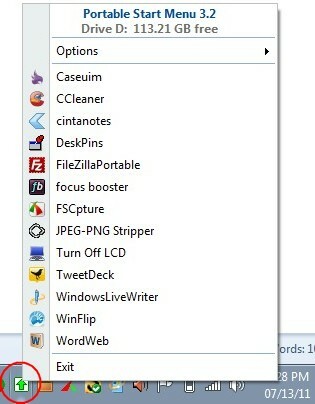 Once installed the application places a tray-icon from which apps can be launched, with a single click. New Applications can be added to the start menu by first clicking on the tray icon, and under Options selecting Applications, which should open a new window like in the image shown below. Next Click “New Application”,where the Application Name, and the exe location can be set.Any parameters that can be passed can also be set in the parameter box and further customizations like icon, window size can be made. 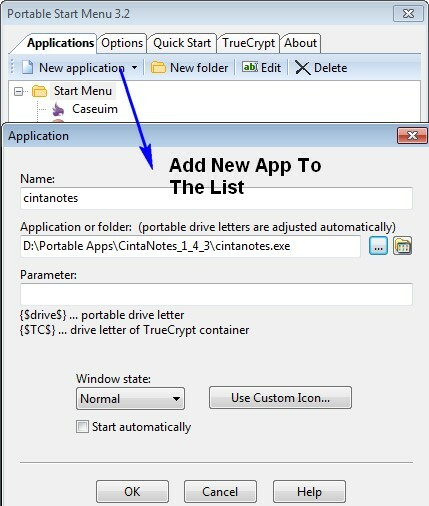 Portable Start Menu can automatically mount and dismount a TrueCrypt container on your USB-Stick or hard disk. All drive letters to that container are adjusted automatically, that means that you can use absolute drive letters within the PSMenu user interface. If you have a lot of portable application stored on your USB Drive then, you can also set PStart Menu to auto start on inserting the USB Drive so that it becomes easy to launch applications from the system tray.To auto start “Portable Start Menu” On inserting the USB Drive, Select “Create AutoRun File” Under Portable Mode in the Options Tab in Settings. The application can be installed as a portable app or a normal program, this option can be chosen during the setup which makes it easy to setup. Do you make use of a application launcher, If YES Share with us what you use or try Portable Start Menu and share your experience.